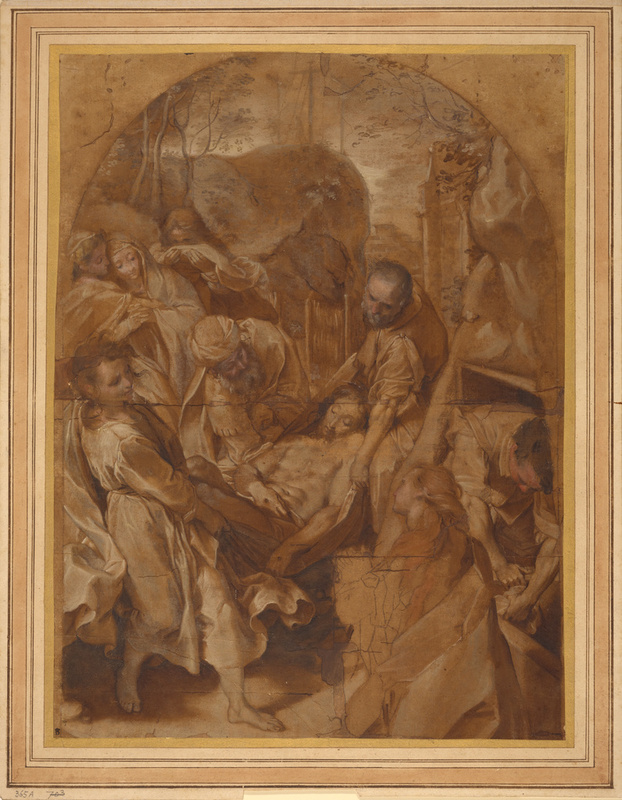 Verso, in brown ink: "P.25"
Federico Barocci made this oil study, the first of two, for an altarpiece in the Church of Santa Croce in Senigallia, Italy. Before beginning this sketch, he oiled the paper, perhaps to eliminate the "halo" the paint's oil would have created as it seeped into the dry paper. Here Barocci studied tonal values for the painting, building a largely monochrome composition from rich, dark browns with brilliant bluish-white highlights in the figures' robes, especially that of the figure on the left who supports Christ's legs. He left the kneeling figure of Saint Mary Magdalene unfinished in the right foreground, though she appears in a similar pose and position in the later, more colorful oil sketch and the finished painting. Barocci commonly used an elaborate preparatory method for planning his pictures. After determining the form of a composition, he made several chalk studies for each figure, including separate studies of the limbs and head. He then drew one or more fully worked-up sketches of the composition, such as this one, and finally moved onto the full-sized cartoon. William Cavendish, third duke of Devonshire, English, 1698 - 1755 (Chatsworth, Derbyshire, England), by inheritance to his son William Cavendish, fourth duke of Devonshire, 1755. William Cavendish, fourth duke of Devonshire, 1720 - 1764 (Chatsworth, Derbyshire, England), by inheritance to his son William Cavendish, fifth duke of Devonshire, 1764. William Cavendish, fifth duke of Devonshire, 1748 - 1811 (Chatsworth, Derbyshire, England), by inheritance to his son William George Spencer Cavendish, fifth duke of Devonshire, 1811. William George Spencer Cavendish, sixth duke of Devonshire, 1790 - 1858 (Chatsworth, Derbyshire, England), by inheritance to his cousin, William Cavendish, seventh duke of Devonshire, 1858. William Cavendish, seventh duke of Devonshire, 1808 - 1891 (Chatsworth, Derbyshire, England), by inheritance to his son, Spencer Compton Cavendish, seventh duke of Devonshire, 1891. Spencer Compton Cavendish, eighth duke of Devonshire, 1833 - 1908 (Chatsworth, Derbyshire, England), by inheritance to his nephew, Victor Christian WIlliam Cavendish, ninth duke of Devonshire, 1908. Victor Christian William Cavendish, ninth duke of Devonshire, 1868 - 1938 (Chatsworth, Derbyshire, England), by inheritance to his son Edward William Spencer Cavendish, tenth duke of Devonshire, 1938. Edward William Spencer Cavendish, tenth duke of Devonshire, 1895 - 1950 (Chatsworth, Derbyshire, England), by inheritance to his son Andrew Roburt Buxton Cavendish, eleventh duke of Devonshire, 1950. Morton Morris & Company Ltd and Galerie Arnoldi-Livie, owned in half-shares. Sold to the J. Paul Getty Museum, 1985 with an invoice for the drawing from the Galerie Arnoldi - Livie (Munich) on behalf of both owners.